With branches at The Celtic Rose Centre Hall on Guildford road, CO12RB, and Rowhedge Village Hall, Rectory Road, Rowhedge. 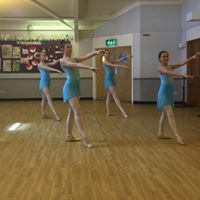 This relatively small and friendly school offers classes in Ballet, Modern/Jazz and Tap, and are given by Valentine Cavanagh-White, a professional dancer, choreographer, qualified and insured dance teacher, whose career as a dancer has taken her to London’s West End and venues all over the world. Valentine has a CDMT recommended teacher award, is RAD trained and is qualified with the ISTD and UKA dance. The school is also Children’s University Learning destination. 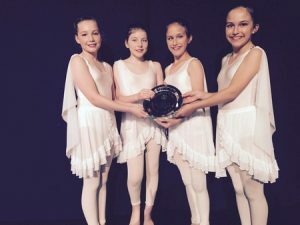 Pupils have performance opportunities in the school shows, local summer fetes, and dance competitions. We have performed in London’s West End and Disneyland, Paris, as well as Colchester’s Mercury Theatre. All pupils are encouraged to take part in our activities, whatever their ability, and class sizes are small which enables the teacher to get to know each pupils individual personality, additional needs and potential. As well as teaching her extensive knowledge of dance styles gained from her years as a professional dancer and dance training which also included National, Greek and Street and Freestyle dance, Musical Theatre and Cabaret, pupils can work towards optional Ofqual regulated RQF accredited ISTD grade examinations, (the higher grades also awarded UCAS points). All students may take part in UKA. medal tests. 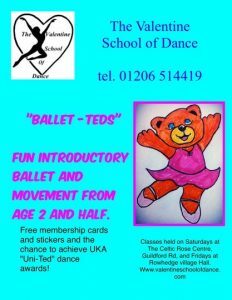 Pre-school children from age 2 and half are especially welcome in our Ballet-Ted classes. 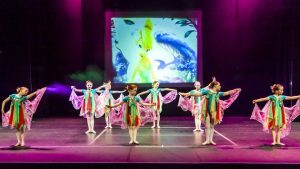 The class is based on general dance and movement with a very creative feel, and introducing children to ballet and modern dance. Children can be entered for the “Uni-Ted” fun awards, and can continue with these also in the primary classes. The children receive “Uni-Ted” membership cards and attendance stickers on full enrolment. Adult classes are given in Beginners and Advanced Ballet, and Improvers/ Advanced Tap. Informal and fun classes on a pay as you go basis, so why not have a go yourself? 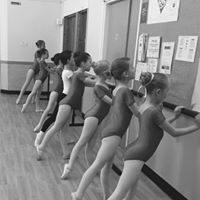 The benefits of dance classes are extensive, including Improving physical health, socialisation and making friends, creativity, self-expression, self-awareness, emotional development, cognitive development, patience and teamwork and of course having fun. Many former pupils have gone on to full time vocational dance training and into the professional dance world. Whether you’d like to learn dance for fun and fitness, or with a dance career in mind, we aim to nurture a lifelong love of dance in all our pupils.